The author, @GlenGilmore, is a social media strategist and educator at the Rutgers School of Business where he teaches executive courses in Digital and Social Media Marketing. An attorney at law, Gilmore is the author of Social Media Law for Business. Earlier this year he was named by Inc. to its list of Top 30 Internet of Things Experts. Dear Reader, please note I have the privilege of serving as a Verizon brand ambassador, which is a sponsored relationship. Rest assured, though, that the words and thoughts in this post are entirely my own and may not necessarily reflect those of Verizon. 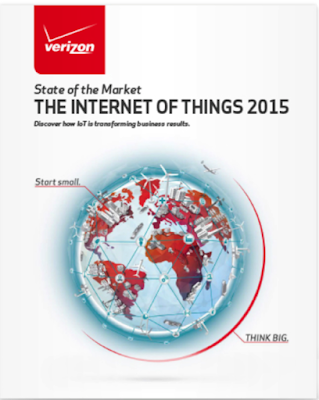 “If you don’t have an IoT strategy, you should.” So begins a 2015 report by Verizon on “The Internet of Things” (IoT). It is sound advice. 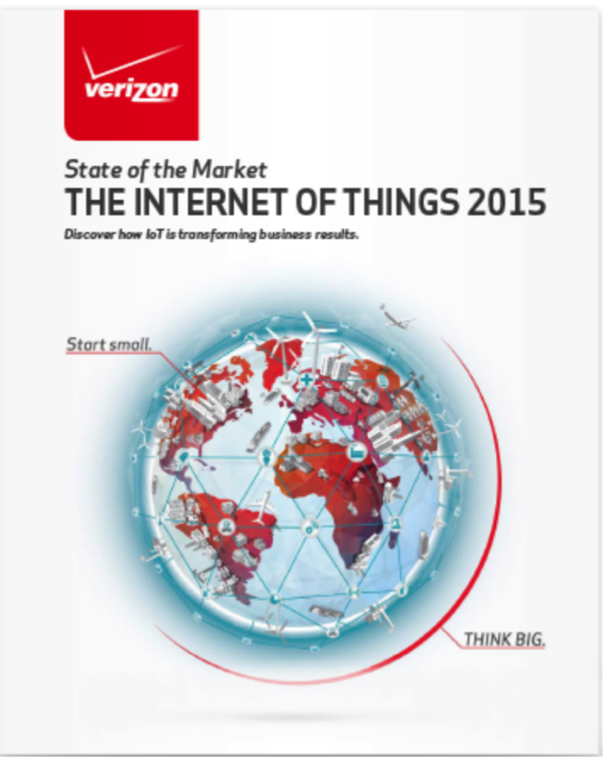 In 2014, Verizon “saw a 45% year-over-year revenue growth” in its IoT business. Its IoT report, which speaks to public and private sector applications of the technology, adds nicely to the understanding of an extremely important topic. The 23-page report, gated by a sign up, outlines what enterprises are currently doing in the IoT space and provides recommendations on what organizations should be doing to “get the most out of it.” If offers examples of the advantages of the technology. The report looks at the IoT application in four sectors: (1) Energy and Utilities, (2) Manufacturing, (3) Public Sector, and (4) Transportation. “The Internet of Things?” It is the world in which we live today. Things of all sorts have become “connected things,” things connected to the Internet via the smallest sensors. It is what gives us the prospect of driverless cars, home thermostats that learn our temperature preferences; smart watches that track how much we’ve slept and how far we’ve run. Get the picture? As the report notes, it will “revolutionize how we live and work,” with more than a billion connected devices in use today. Improving safety and reducing risk. Why is the IoT accelerating so quickly? 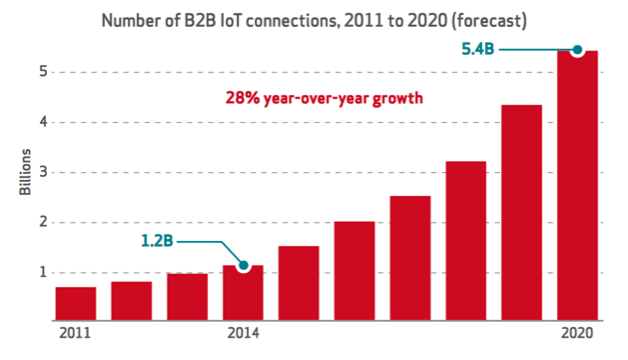 Verizon observes that, “declining cost of sensors, connectivity, and data processing power is making the ROI equations for IoT projects look even more appealing.” In other words, it’s worth the investment. IoT adoption isn’t as pervasive as many report. Interestingly, Verizon study found that the actual number of enterprises that have “adopted IoT extensively” is just at 10%, far less than other reports that suggest a far higher number. One of the biggest challenges of IoT is figuring out how best to use it. Verizon notes that to meet this challenges, even “banks and supermarkets are running public innovation events to generate new ideas for using IoT sensors and data. IoT will make everything much more personal. For business, IoT will take much of the guesswork out of risk assessment. For example, the automotive insurance industry could replace existing methods of premium assignment that rely on broad categories of gender, age and geography, with a driver’s actual driving habits, introducing “usage-based” insurance. This could reward safe drivers and place higher premiums on those whose habits demonstrate a higher risk. IoT will be huge for loss prevention. In many ways IoT will improve worker safety and lessen business losses. "IoT-enabled systems can predict and help prevent accidents,” the report notes. For product inventory, remote awareness of threats will reduce losses by activating cameras or triggering countermeasures. Wearables in the workplace will improve worker wellness and safety. Everyone has an interest in healthcare costs. Wearable technologies provide opportunities for employer and employee collaboration in improving wellness, lessening healthcare costs, and protecting workers in the workplace. In the Energy and Utilities sectors, “sensor data and advanced analytics can be used to predict the failure of critical components,” “avoiding costly breakdowns. And detailed information on local weather conditions.” Smarter meters also give the industry far greater efficiencies, with more sophisticated automation. In Manufacturing, beyond real-time stock management and enhancements to workforce safety and efficiencies, manufacturers can tap into IoT to “remotely monitor the condition of equipment,” reducing costs, lessening customer disruption and improving customer satisfaction. In the public sector, IoT-enabled devices are being used to cut down on energy costs based on actual public usage, smart parking sensors are enhancing down-town visits by reducing drive time and congestion related to finding parking spaces, digital signage is seizing on the aggregation of near real-time traffic information to guide safer and more efficient traffic flow. Network sensors are both collecting data relating to an array of public services, from monitoring air and water quality, infrastructure stability, early alert of public hazards, and automating responses to address tasks in a more efficient, certain and timely manner. An energy management initiative using IoT data-tracking and analysis technologies in Charlotte, North Carolina, helped the city reduce total energy costs of “8.4%, equal to 10M in savings.” Greenhouse gas emissions were also reduced by 20%. In the field of Transportation, IoT technologies will not only make the modes of transportation safer, from cars to trains, but also the transportation pathways themselves, with smart roads and railways providing real-time data and triggering automated safety and efficiency responses. Networked sensors will improve transportation efficiencies and safety. Agreeing to standards is still a hurdle in the IoT space, making the decision for partners so critical to reliability, performance and interoperability, the Verizon report notes. Also, bringing IoT projects to scale deepens the importance of a reliable cloud, as more data is generated and stored. Containing a blunt warning on the risks of an insecure IoT system, the Verizon report notes that hackers could move beyond digital attacks, “like stealing data, moving money, or shutting down websites — they can cause havoc by tampering with infrastructure like electrical grids and traffic signals, or put lives at risk by meddling with healthcare devices, airplanes, or elevators.” It is a warning that those in the public and private sectors should heed with the greatest care. The Verizon report lays out a layered approach to security. It begins with the FTC’s principle of “security by design” and concludes with communications to employees, customers and partners. IoT projects don’t have to be huge to make a difference, Verizon says. Even when enterprises start small, meaningful enhancements in efficiencies and customer satisfaction are likely to be found. Discover how IoT is transforming business results. Speaking of connections…if we’re not already connected on Twitter, please join me! "Work magic." Advice for any young professional: "Do your best to work some magic." I’ve taken a peculiar path from lawyer to social media strategist. My law school alma mater recently invited me back to Harrisburg, Pennsylvania to be their commencement speaker and to talk about my unusual journey, from Law to Social Media. I recently authored a book, Social Media Law for Business (yes, I do get royalties from the sale of the book; a disclosure from an abundance of caution), which I guess added some spark for a graduating class of law students who are entirely digital natives. What follows is my effort to offer a few pearls of wisdom to a graduating class of bright-eyed soon-to-be lawyers from the Widener University School of Law. I chose to speak about the magic of law and social media. The first question posed to the first panel at Social Media World Forum being held at the very cool, cavernous Vinopolis, a wine-tasting venue and wine museum near the London bridge, seemed to this American chair of day one of the event an odd question: “2015 – Was it the first social media British election?” How could it be, I wondered. 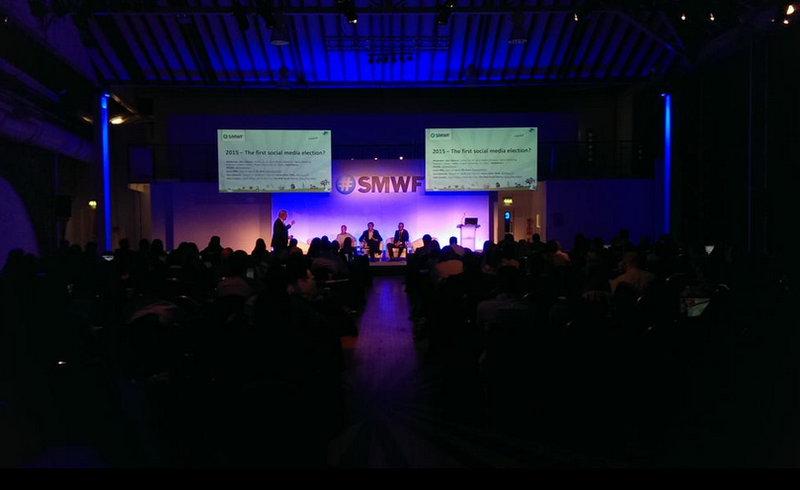 Five hundred attendees, many of the brightest minds and biggest brands (Coca-Cola, GE, Ford, American Express, Conde Nast) in digital and social media marketing from throughout Europe, crammed into a large hall at Vinopolis to hear the answer. Moderating the panel, I decided to pose the question first to the audience. 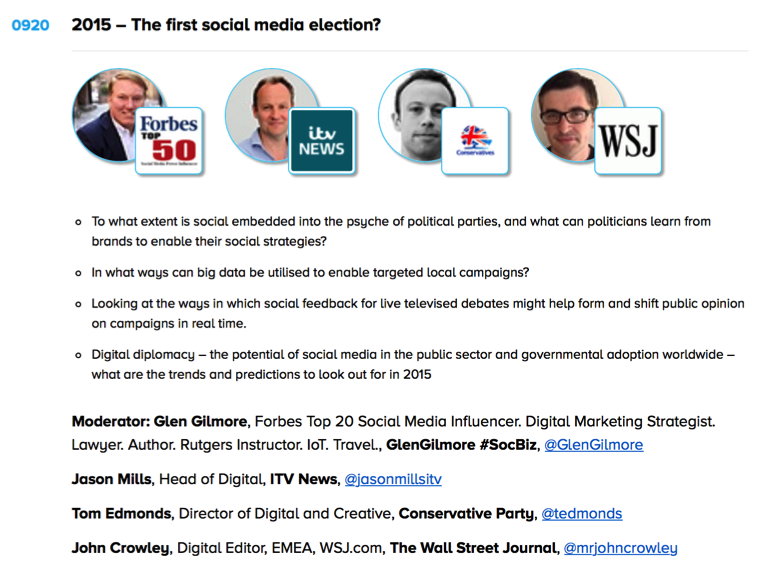 “Was 2015 the first British social media election?” Few hands went up. Turning to my esteemed panel, which included no less a personage than the young Tom Edmonds, who had just finished his highly-successful tour of duty as the Director of Digital and Creative for the Conservative Party (yes, my fellow Americans, that means he’s the guy who headed the reelection of Prime Minister David Cameron in the digital and social space), Jason Mills, head of Digital at ITV News, a fast-growing online news service, and John Crowley, Digital Editor for Europe, the Middle East and Africa, for a traditional and evolving news media news outlet – you may have heard of it: The Wall Street Journal. It’s a whole new world now. Like Gandalf the Grey turning serious, Edwards explained that going into the election, “We knew who we had to move and we moved them with social media.” Edwards explained that it wasn’t all digital. He was quick to credit solid, traditional polling with giving the campaign the insights it needed to target its paid social media marketing to drive votes. to improve social media marketing? 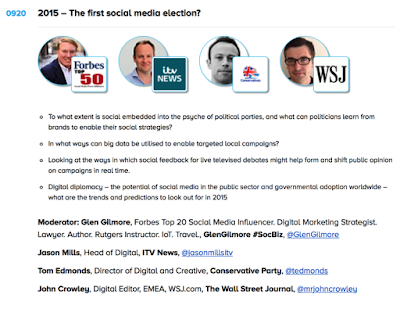 Not leaving the field of digital innovation to social media savvy political consultants, the Wall Street Journal dove into the 2015 British election cycle with its ever high-quality content, this time, however, geared for a readership accustomed to getting its content online in ways that visualize content and reward engagement. stogy old news service like WSJ? Animation, Games and Social Sharing, of course! Explain the basics first. The WSJ always does an excellent job of providing its readers with a solid body of information to understand both the basics and intricacies of big issues. Recognizing that many readers from outside the UK would have an interest in the British election, the WSJ decided to provide content that would explain the British electoral process to outsiders. Er, don’t be surprised by who gravitates to your basic content, when you make it crisp, visual and fun. “What was surprising for the Journal was that our election explainers got a big social engagement from the UK, said Crowley, a journalist who is clearly excited about growing his readership through innovation and digital. We all love a game. “We also played around with formats and created a ‘game' to pair up the parties,” Crowley said. “This did very well for us on social and also served a way to explain what could happen.” Readers were invited to guess how the parties might align themselves in the upcoming election and the game they played gave them instant feedback on how well they did in their pairings. It was supposed to be a close election. It wasn’t. How could everyone be so wrong when social media is so good at sentiment analysis? “Social was a great news gathering tool, but lousy at sentiment (analysis),” said Jason Mills, Head of Digital for ITV News. Mulling over the point, there seemed to be a sentiment (borrowing a poor pun first pulled by Crowley) that it may not have been that the data shared on social was poor or inadequate, but that the analysis was lacking. Professionals have gotten much better at using social media to drive results. Social media marketing in the political arena is getting better – a lot better. Good traditional polling is still a powerful, albeit expensive, tool. Invest in good polling and trust your polling to craft your messaging. Don’t target swing voters with politics. Target swing voters with the meaty issues that matter most to them. The political ads you see in your stream are no coincidence – they are targeted to you personally. Sentiment analysis needs to get better; it’s getting better. There’s still no app that replaces the nitty-gritty social media marketing work of looking at consumer/constituent social media engagement for insights. Media has an important role to play not only in informing voters about election issues, but also about the election process. Make it fun for your readers – heck, make education a game – literally! To get your message across, make it fun. “Personalization” is not just a buzzword of the day in digital marketing, it is a key technique in digital campaigning in the political arena. Twitter is great for getting attention and connecting with media; Facebook (ads) is (are) better at moving voters/consumers. Add animations to your repitoire. Bonus takeaway: Uber-Proof Yourself! This wasn’t mentioned directly in the panel on the British election, but it became a theme throughout day one of Social Media World Forum and was also the essence of the British elections panel as well: Uber-proof yourself, your campaign, your consultancy, your business. Learn to be agile and digital or you won’t make it in politics or the marketplace! What did I miss? I’d love to hear from you if you think I’ve missed any of the lessons from the 2015 British election. One of the things I enjoy doing is getting to work with companies that are forward thinking and thinking about “social good.” Verizon is one such company. On a monthly basis, Verizon holds a Twitter chat, which is simply a time on Twitter when everyone and anyone are welcomed to join an open conversation about a given topic. (Verizon likes to spice it up by usually offering a prize as well to those who RSVP, let their community know about the chat, and join the chat. RSVP@theonlinemom.com). Verizon's May 8th, 2015’s #LifeOnFiOS (the official hashtag) Twitter chat was set to talk about “Technology and Social Good.” Let’s consider some examples. Using Verizon as an example, just scratching the surface, the convergence of “social good and technology” can be found in Verizon’s creation of a video call center that allows customers to ask questions and receive answers using American Sign Language. It’s a social good that comes about from the emergence of a technology that allows video calling in real time. How else might we use this technology for social good? “It’s incredibly helpful” is how one consumer describes Verizon’s “Descriptive Video Service.” Take a quick moment to find out how the service works. I think you’ll be pretty amazed! What more could we be doing? The two examples just given should get our creative juices flowing. Join our chat or, if you missed it, add your suggestions in the comments here! Thanks! Wearables that help kids with autism recognize the emotions of others from their facial expressions…. Augmented reality to help those with color blindness…. Wearables for caregivers to track their loved ones in real time….